The beginning to this story is very random and started a few years ago. I was told that I needed to start making new connections and finding a good lawyer to work with was one person I needed to find. Nervous as can be about picking up the phone and asking a random person out to coffee I looked through various law firms in the city and stumbled upon a picture of Caroline. I though "she looks nice, I will call her"
I still remember standing in the Rexal when she called me back and said "funny you called me, I was just needing a Realtor". We met for a lunch soon after that conversation and have always stayed in touch since. We began the discussion of Caroline and Anthony purchasing a house a few years ago. We discussed what need to be done, set her up with a mortgage broker, and they began working hard to save up the down payment. Just as they had reached their goal the new mortgage rules came into effect and essentially brought them back to square one again. They were faced with the decision to keep saving or to look within their now new budget. 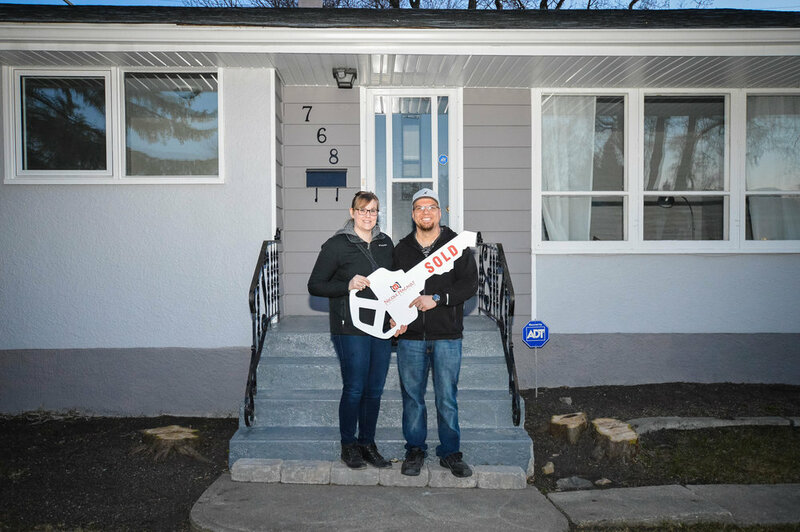 We decided to start looking, and although I can't remember the details, I know that their budget was able to increase and they were able to look at homes that that were closer to what they were initially wanting. Once we started looking it was fast paced and lots of fun. Caroline's father came along to all the showings, and the 4 of us always had a great laugh. It didn't take long till we found "the one", and it was a short time after finding it that we wrote the offer. Today we completed the property inspection and were delighted to hear that there were no surprises and the house was indeed just as awesome as we knew it was. You guys were amazing to work with, and I enjoyed every single showing with you. The constant laughter and joking around, and the permanent smile on Anthony's face will never be forgotten. You guys are amazing and I can't wait to visit you in your new home!